Product #3170 | SKU HDSPEMADI | 0.0 (no ratings yet) Thanks for your rating! 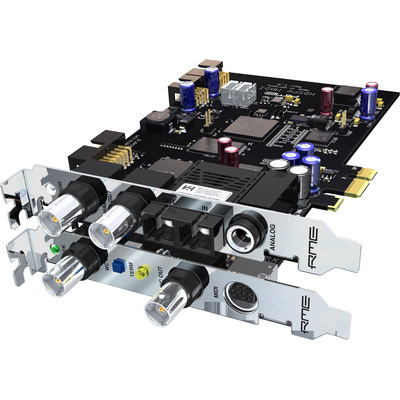 The HDSPe MADI from RME is an inexpensive PCIe Card card that features a MADI interface. The audio system is capable of transferring digital audio data directly into a computer, from any device equipped with a MADI interface. Installation is simple, even for the inexperienced user, thanks to the latest "plug and play" technology. MADI, a multi-channel audio interface, offers full support for 56 and 64 channels of 24-bit audio at a sample rate of up to 48kHz 32 channels at up to 96kHz and 16 at 192kHz. Transmission is done via a single line, either coaxial with BNC plugs or with fiber cable. In both cases more than 100m cable length can be achieved.